UKDN Waterflow > Advice > What is a Manhole/Inspection Chamber? A manhole, or inspection chamber, is an access point to an underground utility network, such as a drainage system. The presence of a drain or sewer manhole allows the underground pipes to be inspected, surveyed, unblocked, cleaned, or repaired. As well as giving access to drains and sewers, manhole chambers are an important temporary storage point for water. They allow water to build up in the drainage system rather than flood out straight away. 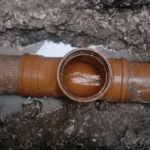 While working on pipe systems, drainage engineers may deliberately block a pipe and use the manhole in the same way, to store waste water before letting it flow away once the drainage task is complete. They are essential for safety, as they prevent people from falling down the manhole or trying to enter the drainage system without permission. Manhole covers also prevent objects and debris from getting into the drainage system where it could cause a blockage. They also prevent surface water from entering the drainage system at that point, so the drainage pipes do not become overfull during heavy rain. Manhole covers can be made from different materials, including steel, concrete, and also recycled plastic. They can also be different shapes, including round, triangular, square, and rectangular. Increasingly, manholes are being replaced or augmented with remote access drainage points, often called rodding points. These are smaller than manhole chambers, so are cheaper to install. Instead of allowing a person to get down into the drain, they provide access for a drain rod, a water jetting hose, or a CCTV drainage survey camera, to assist in the process of inspecting, cleaning, or unblocking a drain pipe. CCTV drainage surveys and drain water jetting can be carried out via a manhole chamber as well. Inspecting, cleaning, and repairing drains without having to enter them is best approach. This is because manhole chambers present a significant health and safety risk. Climbing into and out of them presents a slip, trip, and fall risk, which can result in serious injury and death. Also, oxygen levels can fall in them, especially deeper ones, and toxic gases can also build up. In both cases, someone entering a manhole chamber can quickly become unconscious and die as a result of lack of oxygen or poisoning. The only alternative to using remote access equipment to work on a drainage system via a manhole chamber is by carrying out a confined space entry. This involves using a careful procedure, involving a team of specially-trained drainage operatives, using specific safety equipment and clothing, to enter the manhole chamber safely. Members of the public and trades people who are not trained in confined space entry are strongly advised not to enter a manhole chamber because of these factors. What is at the bottom of a Manhole Chamber? Whether the manhole leads to specialist equipment like a sump pump. Some manhole chambers are very shallow, so are only a few inches or a couple of feet deep. At the bottom of these it is common to see the bottom half of a pipe, commonly made from clay, running off into openings like a train track entering a tunnel. Where the manhole is above a drain pipe junction, the pipe arrangement will be more complicated. In some other cases, manholes may lead to much deeper drains and sewers. In some cases, these might be many metres underground. In this case, the manhole chamber will disappear into the darkness, usually with a steel ladder down one side of the chamber to gain access. Larger manhole chambers may be protected by a steel security grill. This prevents unauthorised access. It also stops items from being dropped down into the drain – usually a larger sewer pipe – to prevent vandalism and protect people working below. In some cases, especially in large urban sewer system, manhole chambers can lead to an even bigger chamber with space for many people to stand and work. What can go wrong with Manhole Chambers? There may not be a manhole in a location needed to carry out a drainage inspection, clean a sewer, or unblock a drain. This may be due to oversight when the drainage system was put in, or because the drainage system has not been updated to cope with subsequent developments. Where this happens, it may be necessary to create a new manhole to gain access to the pipe. A manhole chamber may become buried or built over, either deliberately or by mistake. If necessary, the manhole will have to be excavated to gain access to a particular point in the drain. Or a new drain access point will have to be created at another location. The manhole may become unstable due to the deterioration of the materials it’s made from – or because of ground movement, or action by tree roots. In this case the manhole will have to be repaired or even replaced. Manhole covers may become loose, broken, or lost. This will create a safety hazard and will allow debris and excess water (during periods of heavy rain) to enter the chamber.